Indonesia with its symbol “Unity in Diversity has so many different cultures all over areas. One of them is traditional musical instrument. Traditional musical instrument has an uniqueness in each region. Moreover, It has differences between them. Therefore, Indonesia known as storehouse of traditional art. Gamelan is one of traditional musical instrument from Java island. The term of Gamelan refers to the instrument or tool which pounded. The word Gamelan comes from Javanese word means hitting or beating. Gamelan found since Hindu-Buddhist culture dominated Indonesia. The shape of Gamelan developed from Majapahit era until now. In mythology of Java, Gamelan made by Sang Hyang, God who controlled Java in castle of the Lawu mount. Gamelan usually called as “Karawitan” means musical. Karawitan comes from Javanese languange means complicated but beautiful. Gamelan use a combination notation system and rhythm which easy to listen. Javanese Gamelan is one of the arts and culture which still widely favored by people. Scholar named J.L.A Brandes (1889) said that Javanese people already known ten of expertises before influenced of Hindu-Buddhist. Meanwhile, the development of Gamelan instruments can be found in temples, reliefs, and other ancient heritage. Instruments created gradually and appear separately. Some relic history contained information provided a basic of Gamelan nowadays. The historical record said that Gamelan created by the reliefs of Borobudur temple. It was in eighth century. In reliefs contained several instruments such as drums, bamboo flute, harp, strings, and bells. Since then, the instruments used as an instrument of Gamelan music. Gamelan was played in era Majapahit Kingdom. Javanese Gamelan contain the philosophical and historical value of the people in Indonesia. The development of Gamelan changed gradually. The major changes is from manufacture. The process create a new creativity to combine each tool become united. It contains a diversity of shapes, sizes, tunings, techniques of play, and aesthetics of music. The existence of Gamelan also found in inscriptions and literary books. In literary books of east Java, Gamelan called as “Tabeh – tabehan” means percussion. Meanwhile, in Javanese language, It called “Gambel” means hitter. Then later, It found that Sang Hyang played Gamelan to called the Gods. The development of Gamelan spread across territory in Indonesia. Such as Bali, north and west Sumatra, and others. 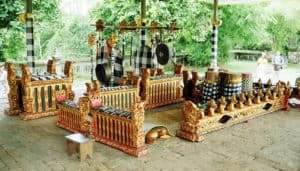 The most popular Gamelan are from Java and Bali. Gamelan in all regions are highly accepted in all conditions. Moreover, the characteristic of society has influenced the characteristic of Gamelan. Bilah – Gamelan made from metal (iron or bronze) and woods. Pencon – Gamelan made from metal and has basin shape. Bentuki – Gamelan with a drum shape. Javanese Gamelan attracted and get overwhelming response in International. It has been held as art performances in various European countries. Gamelan obtained a good review from European. Moreover, school aboard includes Gamelan as music education to be learned. Javanese Gamelan is a set of typical Javanese traditional instruments. It handed down from previous generation until now. Gamelan can be found in central Java and Yogyakarta. Gamelan has a soft music and reflects the harmony of life. It used to be a principle of life that adopted by Java community. 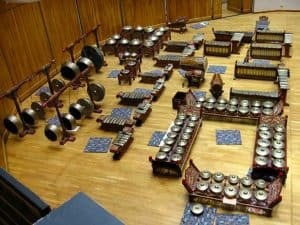 Gamelan instruments – Either partially or whole. The Barrel – Either Gamelan instruments or non Gamelan instruments. Vocal or the mixture of both. Saron – Saron played by hit with a wood bat. Saron is main melody in Gamelan. It contains bladed iron, brass, and bronze as materials. Demung – Same as Saron. It hit a octave lower melody than the Saron and sound louder. The hitter is bigger than Saron. Howl – The tool is smaller than saron but it hit higher octave. It makes a diversity of sound with beats. The bat made from cow horn. Its rhythm is twice than Saron. Bonang Barung – Musical instrument made by iron, brass, and bronze. The bat made by wood. Bonang played between two paddles. Bonang Barung is the main melodic instrument in Gamelan. It consists of 12 – 14 pieces. Bonang Penerus – The shape is same as Bonang Barung. It used to be Bonang Barung filler. It has an octave higher than Bonang Barung. Kenong – Played as filler of chord and harmony in Gamelan. Kenong confirmed the right rhythm. It also include the race musical instrument. Kethuk Kempyang – It used to maintenance a rhythm. It places aside with Kenong. Gender Barung – This instrument is played using two paddles. The function is similar to Saron but with different sound. It made by iron, brass, and bronze. Gender Penerus – Identical with Bonang Penerus. It rhythm faster than Gender Barung. Slenthem – The instrument played by a bat. Its function is similar to saron but has different timbre and pitch. It sound one octave lower. Kempul – The instrument made from bronze. Kempul is called a small Gong, played by being hit using a paddle larger than Kenong bat. Kenong is a stakeholders. Gong Siyem and Suwukan – The magnitude between Kempul and Gong Gede. Xylophone – The instrument which most played in orchestra. The function is similar as Gender Barung. It consists of 19 or 20 pieces of wood and play with two bates. There are some other instruments such as flute, Siter, and fiddle which completed the Gamelan orchestra. Philosophically of the Javanese plays the important role in Javanese life. The philosophically associated with Java cultural arts. Therefore, It related to Java religion there. In Java, Gamelan has aesthetic functions related to social values, moral, and spiritual. Meanwhile, Gamelan already known as east traditional instrument which balanced with west music genres. Therefore, Gamelan is a flexible musical instrument that served education. Balinese Gamelan is usually called as “Gambelan”. It commonly used for traditional events like ritual procession of funeral. Meanwhile, There are two types the way to use Gambelan. First, for human ceremony use gender while temple ceremony use big gong. Gambelan Wayah – It also called as the old Gambelan. It established since 15th century. Gambelan Madya – Established since 16th century. It contains Kendang and other instruments. Gambelan Anyar – It contains a new type of Gambelan in 20th century. Gambelan Bleganjur – It plays with various rhythm. Balinese Gamelan plays important role in Balinese life. It often used along with religious ceremonies. Meanwhile, Balinese Gamelan often featured as well as variety of Balinese art. Gambelan can not be separated from the concept of Balinese. It called Tri Hita Karana. Then, It contains three harmonies. there are the harmony between human with God (Parhyangan), human with others (Pawongan), and with nature (Palemahan). Gambelan in religious ceremonies – Gambelan Gender Wayang usually plays along with Mesangih ceremonies. Meanwhile, Gambelan Bleganjur often used in Melasti ceremony. Indeed, many functions of Gambelan in religious ceremonies. Gambelan in society – The players of Gambelan often introduce Gambelan to tourists. It attracts them to learn. Meanwhile, It also often use for gain new relationship through music. Gambelan in economy – Gambelan plays vital role in the development of tourism in Bali. It brings a significant impacts on the economy aspect. especially for Balinese themselves. Gambelan orchestra often plays in Bali Art Festival every years. There are different ways to play between Javanese Gamelan and Balinese Gamelan. Javanese Gamelan orchestra often called “Karawitan”. It often growth continuously since King Syailendra era. Gamelan in Syailendra era contains one octave divide to five tones. There are 1,2,3,5,6. Meanwhile, in Majapahit era changed to Gamelan Pelog with seven tones from one to seven. Karawitan is the great traditional music orchestra in Java. It shows happy, anxiety, sad, funny and other emotions on it. However, the appearance of Karawitan contains ethics and etiquette. Time of start and end must be not overstep. The beat of music in well manner. It not allowed to play while smoke or eating. There is no conversation while playing orchestra. Surakarta style – From Keraton of Surakarta. It develops in central, west, and east Java. Jogjakarta style – From Keraton of Jogjakarta. It grown mainly in Jogjakarta area. As well as central, east, and west Java. Semarang style – It grown mainly in central Java. Surabaya style – Evolves in Mojokerto, Jombang, and Malang areas. The most widely growth of dialect is Surakarta style. Its dialect developed into distinctively local musicians. Such as from Sragen, Ngawi, Madiun, and other Java areas. Along with Jineman (quiet), and Srepegan (angry). It contains five types of songs. There are eight techniques of Balinese Gamelan. Technic of Kendang – The combination between Lanang and Wadon. The stones motive is lanang plays along with drums. Ngundah motive is combination of lanang and Wadon with some variations. Nganduh motive is drum plays along with Ngundah motive uses as a sign to the end. Technic of Reong – Usually plays with four people. There are compositions to play this Technic. Technic of Jublag – Focus on hitting the main melody. It plays consist or steady with no variation. Alit Resume – The smallest Gangsa Jongkok. It contains five melodies in one octave. Ageng – Bigger than Alit Resume. Meanwhile, It contains a similar melodies with Alit Resume. Penunggal – It has a lower octave than Alit and Ageng. Technic of Jegongan – It roles as holders of melody. Punches that bring notes to all instruments. Technic of Terompong – The instrument played by a drummer using the pelvis in both hands. It contains a stoll seating. Technic of Ceng Kopyak – It classified as ornamentation instruments. It provides decorations for a better presentation. Gamelan is one of precious heritage which it existences can not be separated with the various aspects of life. It ranges from social, economic, religious, and the environment. The many functions and roles in Gamelan become important to keep the culture. Therefore, Gamelan always preserved as a valuable tradition and culture of Indonesia.